Philadelphia Eagles quarterback Nick Foles reacts after throwing a touchdown pass against the Oakland Raiders. On Thursday, we took a look at who the various NFL experts around the country were predicting to win the NFC wild-card games this weekend in an effort to see who the Eagles might host in their playoff opener next Saturday. If the experts prove to be correct, it's looking like a rematch of the 2014 matchup against the Saints, one the Eagles lost in Chip Kelly's first season at the helm. That's not great news for Birds fans, as Vegas sees them as the toughest potential divisional-round opponent for Philly. NFC wild-card picks roundup: Who will the Eagles face in playoff opener? As we pointed out earlier this week, even the most-favorable potential matchup (the Falcons) would still be a pick-em at this point, so it's not like there are any great options for the Eagles. If this edition of What They're Saying is a little glass-half-empty for your taste, just know it's not my fault. It's called What THEY'RE Saying for a reason – and right now, it doesn't seem like there's a whole lot of positives surrounding this team as it heads into the playoffs. But we'll try to start it on a positive note, if you stick around to the end, I promise we'll end it on a high note and send you into the weekend the right way. While taking a look at the Eagles' potential opponents – and ranking them based on how tough they are – Tim offers up a stat that should calm some nerves ... right up until you read the next sentence. Meanwhile in Minnesota, they're pretty confident the Eagles will be long gone by the time the Vikings would have to potentially face them in the NFC Championship. Outside the locker room, the national media is abandoning ship. Down MVP candidate Carson Wentz, the top-seeded Eagles are not just no longer the NFC favorites, they are now looking at a divisional round exit, according to Sports Illustrated. Of 11 staffers polled, 10 have the Eagles losing in the divisional round, when they will host either the winner of Saints-Panthers or the Falcons, should they beat the Rams — fingers crossed. Shoutout to Andrew Brandt for picking the Eagles to knock off the Saints in the divisional round before losing to the Vikings in the NFC Championship Game. The Eagles could lose more than just a game in the coming weeks. Several of their assistants have been tapped for interviews for head coaching vacancies, most recently with the Cardinals interviewing defensive coordinator Jim Schwartz, who has already been contacted by the Giants, as well as QB coach John DeFilippo, who is also drawing interest from the Bears. The Cardinals are in town to interview #Eagles QBs coach John DeFilippo and DC Jim Schwartz for their HC opening today, per source. Schwartz goes this afternoon. Flip tonight. Perhaps more importantly, the Birds could also lose Joe Douglas, who has been an integral part of building this current roster. According to a report from the Houston Chronicle, Douglas is one of six names being mentioned in relation to the Texans' vacant GM position. Douglas is under contract and the Eagles will likely do everything they can to block the Texans, but it becomes tougher because the Texans' new GM will have "full authority over personnel." Remember when I promised you something positive? The turnover on downs is what sticks in the minds of most fans, as does Foles’ ugly interception a couple of series later. 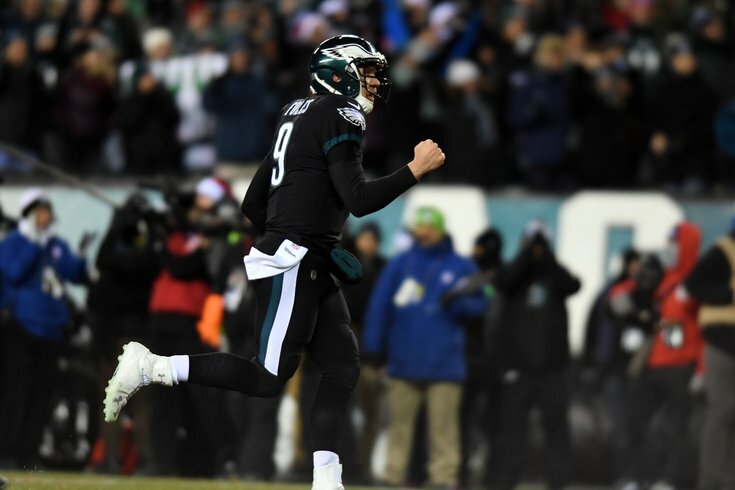 But in that ultimately unsuccessful first drive against the Cowboys, Foles showed he still has the ability to effectively run the Eagles offense.